Devon Tread F1 watch worn by Robert Downey Jr. in the Avengers: Infinity War movie. A box office hit on its opening weekend, Avengers: Infinity War continues to attract loves of the super heroes. In addition to the celebrities that are shining on the big screen in the Marvel Studios film that witnesses Iron Man, Thor, the Hulk and all of the other Avengers uniting to fight one of the most powerful enemies to date, a Devon watch also took the limelight … on the wrist of Robert Downey Jr.’s character, the incredible Tony Stark (aka Iron Man. In the movie, he wears a Devon Tread 1F watch, which uses revolutionary glass-reinforced nylon belts to indicate the time using bold yellow numbers. Recently, on my Perfect Timing column on Forbes.com, I wrote about this watch, and here are those details. “American made, Devon’s high-tech watches – first unveiled to world nearly a decade ago — house materials sourced from a California aerospace company that works with Devon to make the impossible possible. The watches – with belt-driven time indication – are the result of a pioneering technology and are revolutionary in looks. The watch movements are engineering masterpieces. Each utilizes the brand’s patented system of interwoven Time Belts that display the hours, minutes and seconds (which can be stopped at will). The watches combine glass-reinforced nylon belts (which are used in gauges on the original 747 aircraft) with high-tech optical recognition cells, micro-step motors, and 313 electrical contacts. 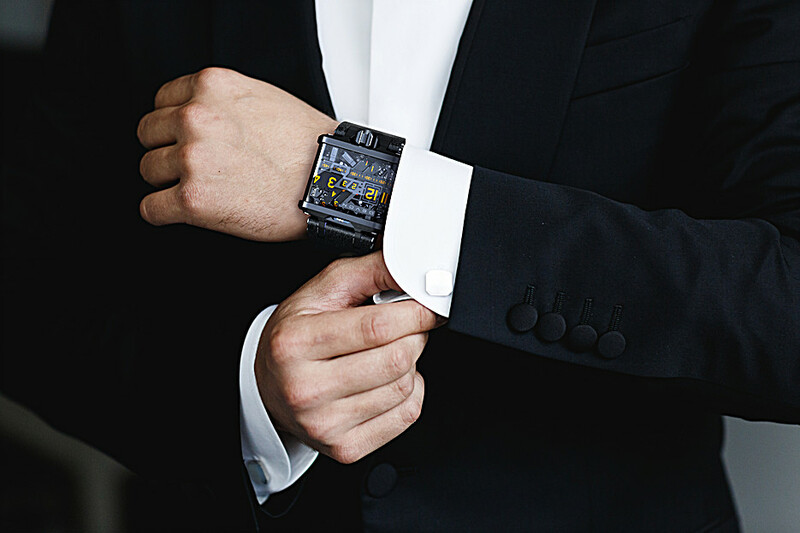 In fact, the circuit and control boards, and onboard microprocessor that is essentially a tiny computer — make the timepiece an engineering masterpiece. 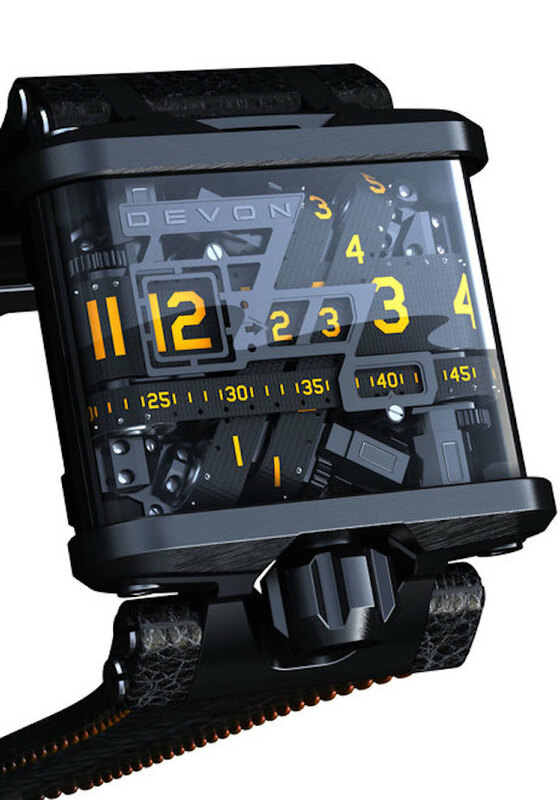 The Devon Tread 1F watch with yellow numerals and accents that was worn in the Avengers: Infinity War movie retails for about $19,900. Each Devon Tread watch houses a lithium-polymer rechargeable cell that runs for up to two weeks from a single charge. For the Tread 1 and Tread 1F watch, worn by Robert Downey Jr. in Avengers: Infinity War, that charge takes about 20 hours. It is done via a charging tower (without wires). The Devon Tread 1F retails for $19,900.